16-May-2006 -- After a short visit to Andijan to look at wheat breeding there we returned to Tashkent by taxi. The route passes quite close to 3 points (41N, 70, 71 and 72E). I did not have a map but only the NASA satellite images. These showed that the most easterly point is in the middle of a heavily populated and farming area, the central one was furthest from the route but on dry land and not far from a small track and the third one was nearest to the road but from observation on the way to Andijan looked as though it might require some climbing. I now see from the DCP page that 41N 70E is at about 975 metres – am glad I didn’t go for that one as it would be a minimum of 300 metres climbing - and you know how they are always halfway down the slope on the other side of the ridge..
As the temperature was around 40C and taxi drivers are not keen on driving up and down little lanes and asking local inhabitants about imaginary place I went for the middle one (41N 71E). The point lies about 20km from the main road. We persuaded the taxi driver to turn north but then started to get cold feet when we found we were headed directly for a prison. The road goes between 2 halves of the prison and although we had to stop and dodge round lots of barriers, nobody actually wanted to check us. Apparently the prison is used for many of those arrested in Andijan one year ago. The good asphalt road took us to within 3 km of the point and then we found a track to take us most of the rest of the way. With a jeep we could have driven to the point itself but taxi drivers need to protect their assets! I walked 600 metres to the point while the driver and my interpreter stopped for a cigarette and I expect a discussion about daft foreigners. The point itself lies on a large dry alluvial fan leading down from snowy peaks on the Kyrgyz border. Strange to see snow when standing in such heat! Almost the only plant was a strong smelling herb. 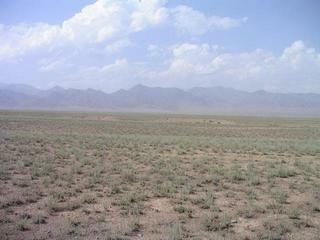 After the lush Fergana valley – said to be the most fertile part of central Asia, this is a bleak place. Water is everything in this climate. The point itself lay almost on a jeep track. Back to the taxi and then to Tashkent via the bread sellers and the Kamchik pass. A new road and tunnel was constructed over this pass after it became impossible to travel by car or rail to the Fergana valley via Tajikistan. In fact the pass has cut several hours off the time taken for the journey but it could be very difficult before the tunnel was constructed – especially in winter. It is interesting to study the way in which the borders of Uzbekistan, Tajikistan and Kyrgyzstan intertwine – It is said that it was the act of Stalin to make independence impossible.